7E/A. 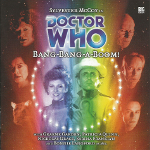 Doctor Who - Bang-Bang-A-Boom! I am far more than just another Time Lord. Dark Space 8 - an advanced monitoring station floating serenely among the stars. Its crew - a dedicated and highly-skilled group of professionals, calmly going about their vital work. Its mission - to boldly host the Intergalactic Song Contest.